Earring of Lil Ghost (center) was digitally coveredTV show, I Flore Delle Sorelle. Photo: Screenshoot of iQiyi. Are male stars banned from wearing earrings in TV shows? That topic generates a public debate on sexual discrimination, with some urging respect for the diverse fashion styles of men. Jing Boran, a Chinese actor and singer in the TV show I Actor which started in December 2018, was seen with his earring digitally covered, as were the earrings of Lin Yanjun and Lil Ghost, members of a Chinese idol group called Nine Percent in I Flore Delle Sorelle, also a reality TV show. Jing's earring was digitally covered on the third episode aired on January 5. 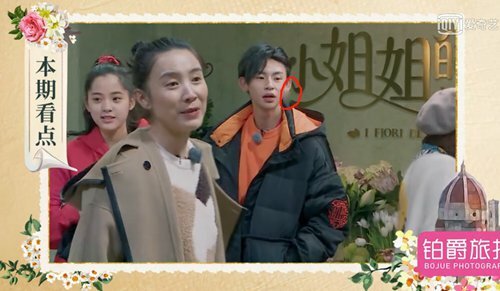 The Global Times found that Jing only covered his earring on the third episode. The earrings of Lin Yanjun and Lil Ghost were also digitally covered throughout the TV show. A TV show company employee who requested anonymity denied to the Global Times that authorities had banned the use of earrings on the show. Screenshots of the scenes soon went viral on Sina Weibo, China's Twitter-like social media platform, with some saying that men who wear earrings are "ugly" and "girlish." Some went further by saying that "such celebrities will mislead children." Other netizens disagreed. "The accusation is sexism," said "Tiancaixiaoqizi." Many also urged society to be more tolerant of men's fashion styles. A heated debate on China's new feminine-looking male celebrities flooded Sina Weibo in September 2018, as the Xinhua News Agency slammed "girlish" idols, saying China's youth will have a masculinity crisis if they follow their pop idols' speech or attire. The People's Daily soon published an editorial calling for people to understand and respect diversity.